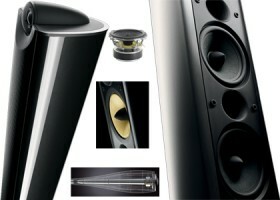 JohnnieFromTheBlog – B&W XT8, Design speakers with hi-fi qualities. Lifestyle design with slim design speakers and high-fidelity audio does usually not walk hand in hand. In most cases, unless you have an unlimited cash flow, you will have to compromise in either the sound quality or the design to achieve the other. B&W XT8 are in my opinion a rare exception! The slim and well-built aluminum cabinets come in either brushed silver finish or glossy black lacquer and have an appearance that should be accepted by most wives. And here’s where the sound quality compromises usually take place, but not in this case! B&W XT8 are transparent and linear with a nice smooth midrange supplied by the FST Kevlar driver. The bass is absolutely amazing! It has depth and punch that would not be expected from a speaker with only two 5-inch bass drivers. The Nautilus technology featured tweeter delivers very high resolution and details without being rough in any way. The sound stage is big and the overall sound characteristics is slightly warm and laidback. You can play surprisingly loud without the speakers showing any signs of strains. They are however quite heavy driven and power hungry, you will need a muscle amplifier to drive these and I would recommend nothing less than a stable 80-100W atleast. Okay, so B&W XT8 costs 28.000SEK which is a decent amount of money. But for the money you get a lifestyle designed speaker that looks like it would come from Bang & Olufsen but sounds like a high end B&W. Book a demo, go listen! ← iPhone, still the best phone?